Do you read audio books? I do! #cocktailoftheweekend meets #whatimreading My latest unabridged Audible.com selection, this one read by the Author, was a cookbook memoir by Susan Herrmann Loomis entitled In A French Kitchen and it was great! 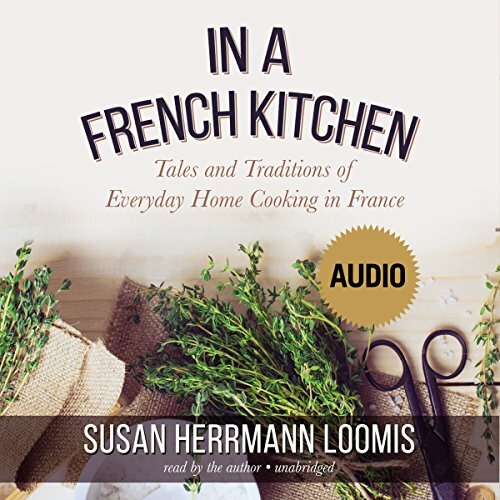 The reader/listener reviews on Audible included those who “didn’t want to listen to a cookbook on tape” but even as odd as an audio cookbook sounds – I loved it! This audio book comes with a pdf download of all the recipes in the book and, this past weekend, after serving handcrafted cocktails all day at an afternoon garden wedding, my bar staff and I hiked up to the top of my property with a bottle of Non-GMO Bordeaux and a bowl of local strawberries to enjoy a recipe from the book while we relaxed by a campfire, watched the sunset, and basked in the success of a wonderful day. Please consider giving Susan’s wonderful book a listen! I have not gotten permission to post this screenshot of the recipe but if it, and my post, encourages you to get her great book then I think she and the publishers might forgive me. Strawberries in Bordeaux wine are sensational! A revelation. The view was also great . . .
Posted in Cocktail of the Weekend, EdgehillHerbFarm.Blog. Tagged #cocktailoftheweekend, #edgehillherbfarm, #whatimreading, Bordeaux Strawberries, Edgehill Herb Farm, In a French Kitchen, Susan Herrmann Loomis. Previous: Previous post: “Cooking from Scratch for One” continues . . .